one × 8 = Required Please enter the correct value. The best Keystone pipeline stocks to buy aren't necessarily the ones you'd think of first. The Keystone XL pipeline officially rose from the dead on Friday (March 24) after President Donald Trump issued a presidential permit that reverses President Barack Obama's 2015 decision to kill the project. The 1,179-mile Keystone pipeline would carry more than 800,000 barrels of heavy crude from the Athabasca oil sands in Alberta, Canada, to refineries on the U.S. Gulf Coast. To be sure, the company behind the Keystone XL pipeline, TransCanada Corp. (NYSE: TRP), is a major winner from this decision. TRP first applied for a permit from the U.S. State Department in 2008. The stock is up 6.67% since Trump was elected. But the approval of the Keystone pipeline has investment ramifications far beyond just that one oil pipeline…. The sudden revival of the Keystone pipeline symbolizes a sea of change in White House policy from the Obama administration. For the foreseeable future, "Keystone pipeline stocks" will benefit from the Trump administration's favorable stance on oil and natural gas pipelines. For example, last month President Trump ordered the final permit to enable completion of another high-profile project, the Dakota Access pipeline (DAPL), be granted. 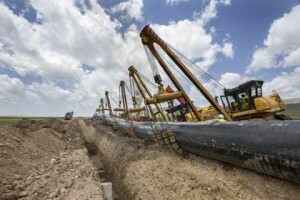 This Energy Transfer Partners LP (NYSE: ETP) pipeline will carry Bakken oil to Patoka, Ill., where existing pipelines will transport it to refineries. But investors looking for Keystone pipeline stock plays beyond the headlines have been sent down a few blind alleys by the financial media. When President Trump initiated the process in January of getting both the Keystone XL and Dakota Access pipelines approved, he also said new pipelines would be required to use U.S. steel. That triggered a wave of financial news stories suggesting that buying steelmaker stocks would be a good way to play the Keystone pipeline construction. What they failed to point out was that TransCanada had bought and stockpiled the steel for the Keystone pipeline long ago. Very little U.S.-made steel will be used. And even if TransCanada did need to buy a lot of steel for the Keystone XL pipeline, it would have a tough time getting what it needed from U.S. suppliers. You see, U.S. steelmakers don't have the facilities to manufacture pipe that meets the requirements of the Keystone pipeline – most of those steelmakers that do are in India and Russia. Other major projects may face the same issue, which will make President Trump's order difficult to enforce – and U.S. steelmakers a flawed way to play the new pipeline-friendly environment. But while the U.S. steelmakers may not be the best Keystone pipeline stocks to buy, another sector will reap major benefits from President Trump's pro-pipeline stance.